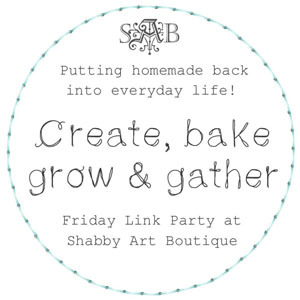 Have you been following Jenny of Elefantz's Shabby Roses - BOM? I really enjoyed doing this one. It is just so feminine and pretty. I decided to use Spring Magic Roses for the final border and I just love it !! 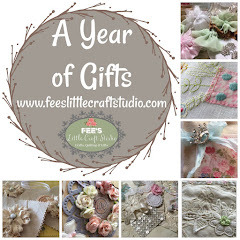 If you are wanting to make your own "Shabby Roses" Quilt I have a limited number of kits available for $130.00 Each with FREE Postage within Australia. Or You may prefer to buy the Complete Pattern Pack of all 12 Blocks for a "Special" Limited Time Only Price of $36.00 + $2 Postage within Australia - That is just $3 per pattern...... Be Quick this offer will not last !! This is for a Colour Printed Pattern Pack and not a PDF. And here is a preview of my newest quilt to be released in the next few weeks (When I have had the time to write up the pattern). 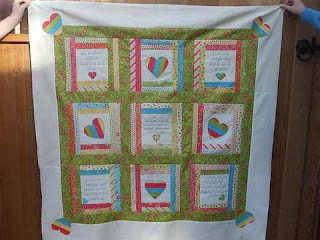 It is called "Love & Friendship" and is a lovely lap quilt with lots of gorgeous "sayings". 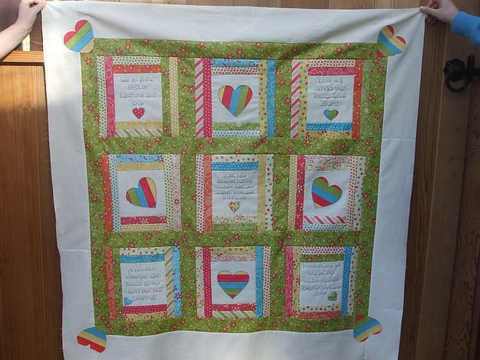 Pattern will be available WHOLESALE to interested parties as this quilt would make a perfect little 9 Part BOM. I also have lots of other projects on the boil at present so stay tuned for some more reveals really soon. 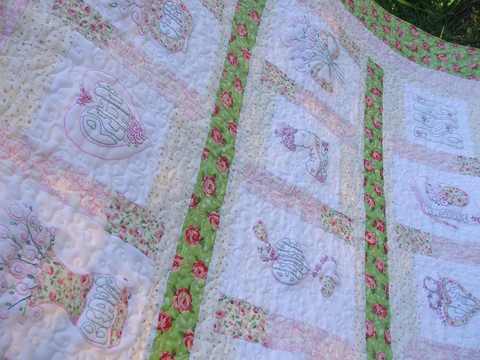 Your shabby rose quilt is beautiful!!! I just traced my last blocks tonight. And I love your new pattern!!! 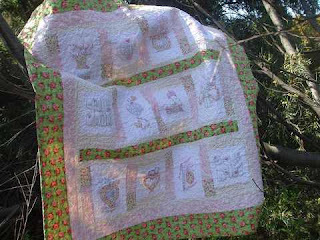 Your shabby roses quilt turned out very pretty. I´m still working on mine, but I´m not sure about what border to use. 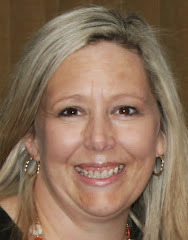 If you want pop over to my blog and give me some advice, I would apreciate it. What a beautiful and romantic quilt! You did a great job! Your Shabby Roses Quilt looks wonderful, I am also doing this one, atm. I have put all 12 blocks together and now on finishing the the last 3 of the outer borders, very scary now as its getting rather large for me. Thanks for the sweet apron pattern. Your rose quilt is lovely. I still have two blocks to do.